In the dark of Monday night before light broke on Tuesday, Cyprus, the small Mediterranean island invaded and occupied for 42 years by Turkish troops with US and UK backing, began a revolution its president, Nicos Anastasiades (lead image, 4), doesn’t want. 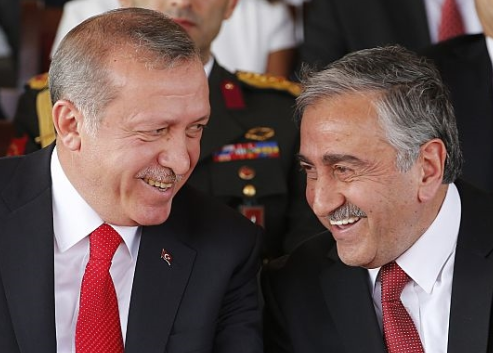 and Turkish President Recep Tayyip Erdogan (left), on a formula cutting the number of Greek Cypriots who would be allowed to return to their homes, preventing the revival of Greek-Cypriot towns in the occupied northern sector of the island; and restricting Greek-Cypriot access to invest in the coast line and the gas-rich offshore seabed. In the latest round of talks, which started in 2014, the financing mechanism has shifted to international banks backed by US and EU guarantees, as well as government aid. The territorial formula was re-weighted, however, as the Turks decided they would be better off in their present situation than with the territorial and financial concessions required by the old formula. “Their new formula was more like one-half cash compensation, one-quarter exchange, one-quarter return”, a source close to the talks says. Anastasiades has so far not made public the precise terms. The Turks also insisted the new formula should be incorporated in their map of the power distribution between the communities on the island. That map, the Turks also demanded, should be swiftly endorsed by a meeting of guarantee powers – Turkey, the UK, and Greece. The troika had been part of the independence pact when London gave up its colonial rule of the island in 1960. Ankara’s insistence on the guarantee proviso also meant that Turkish troops would stay on the island. This was anathema to the Greek Cypriots, but not an insurmountable obstacle for Anastasiades. Cypriot and Greek sources say he was persuaded by Victoria Nuland (lead image, 1), the State Department official in charge of US policy in the region. She told Anastasiades the Turkish forces could be withdrawn to appease Cypriot voters, but then returned under a NATO flag in a new American-funded NATO base in the north. The Nuland plan was accompanied by further promises of US payoffs for Anastasiades and his supporters. Nuland knew her man, so there were sticks as well as carrots. To ensure Anastasiades stuck to his bargain, the Nuland plan also threatened him with US legal trouble for himself, his family, his bank accounts, and his law firm stemming from their corrupt involvement with Leonid Lebedev. He’s the the fugitive Russian businessman, now sheltered by the US, whom Anastasiades and his law partners served for almost a decade. For details of their dealings, and the origin of Lebedev’s fortune in Russian corporate crime, read this. Anastasiades claims through his spokesman there has been no Nuland plan. He refers questions about Lebedev to his law firm. These questions are shortly to take the form of New York court-ordered subpoenas for evidence from the Antasasiades law firm in Limassol, before he became president; and for his business partner still at the firm, Theofanis Philippou. Click for more. Sources close to the Cypriot negotiating side now say the failure of the Mont Pèlerin negotiations to produce property or money means Anastasiades is much more vulnerable among Cyprus voters than he would have been if he had returned from Switzerland waving a property map, and promising cash for concessions to the Turks. The “Cyprus problem” is shorthand for the role of the military forces of Greece, Turkey and the UK as security guarantees for the island. The breakthrough came from Greek Foreign Minister, Nikos Kotzias (below, left), who has spent months changing Greek policy to explicit rejection, not only of Greek participation in the guarantees, but also of the entire security framework proposed by Nuland. The new script -- Greek Foreign Minister Nikos Kotzias, with Russian Foreign Minister Sergei Lavrov. Sources close to Kotzias say he regards the three-power guarantees as a colonial hangover which is no longer possible for independent states like Cyprus and Greece to accept. One of the sources explains: “The so called guarantees stand on a tripod. Without Greece the tripod cannot stand. Moreover, Greece as an EU member and a democracy cannot in either capacity cannot guarantee a third country. The Greek Constitution cannot allow it. And by the way, neither does UK law. So Turkey is left standing alone, with Nuland pushing. So without Greece, the system of guarantees for Cyprus can have no legitimacy. The likes of Anastasiades see this as the ‘Cyprus problem’. Kotzias wants a Cyprus solution without the ‘Cyprus problem’. That means no system of guarantees. If you preserve guarantees and allow Turkish troops or NATO troops to stay, it’s back to square one. Actually, it’s worse for Cyprus, because it will be forever. Greek reporter Costa Venizelou revealed this week that Kotzias has been building academic, expert and government support in Athens for this policy since a closed-door conference in Oxford in mid-January. From that, according to Venizelou, Kotzias composed a paper which became Greek policy, but ran into resistance from Anastasiades in Nicosia. Nuland backed Anastasiades against Kotzias. But Nuland, a candidate to become Secretary of State if Hillary Clinton had won the election of November 8, became a nonentity the day after. When Anastasiades (below, left) met with Greek Prime Minister Alexis Tsipras (right) in Athens on November 16, before the talks resumed at Mont Pèlerin, Anastasiades was obliged to listen, then accept the new Greek doctrine. Kotzias followed up with his counterparts in Germany and France to produce their agreement that the guarantee system is done for, and Turkish military forces in Cyprus, too. Kotzias told Berlin and Paris the principle of no guarantees applies to all countries, and not simply to Cyprus. 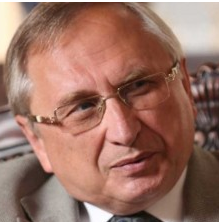 and Russian Ambassador to Cyprus Stanislav Osadchiy, for promoting the no-guarantees position, and for manipulating Cypriot public opinion, as well as the government in Athens. The Russian officials have repeatedly said they were opposed to the Nuland plan, and to any form of US and NATO-directed conference to rubber-stamp the terms Moscow suspected Anastasiades was ready to accept. Lavrov was in Athens on November 1 and 2, meeting Kotzias and Tsipras. He preceded Anastasiades by a fortnight. Lavrov in his press remarks and his ministry in its communiques played up the warmth of the relationship with Kotzias and Tsipras, but played down their discussion of the Cyprus security formula. “Naturally, we discussed the developments around the Cyprus settlement,” Lavrov told a reporter. “In this regard, it is necessary to fulfil UN resolutions just as in all other crises. They outline the contours of a settlement that will be stable and acceptable both for Turkish and Greek Cypriots.” The Foreign Ministry communique on Lavrov’s visit to Athens omitted to mention Cyprus. Veteran Greek and Cypriot officials are also reticent about the role and value of Russian support for the Kotzias doctrine. “The long history shows,” comments one, “that whether we refer to Empress Catherine, Stalin, or Putin, what the Russians say to the Hellenes and what they do aren’t the same thing.” For background on unfulfilled Russian promises, read this. This has triggered a media campaign in both countries, as well as in London, Brussels and Washington, to close the Mediterranean to the Russian Navy. The Cyprus Mail reported yesterday that jet fuel for Russian Air Force operations in Syria is being “smuggled” by tankers making port calls in Cyprus, enroute to Syria. The origin of the story was claimed to be “an intelligence source with a European Union government”. Although Russian officials have identified the UN Security Council as the only legitimate guarantor of Cyprus security, they, together with Cyprus and Greek representatives, are privately critical of the role played in the negotiations by Espen Barth Eide (lead image-3), the Special Representative of the UN Secretary-General on Cyprus. A native of Norway, he was Norway’s defence minister and foreign minister in Labor Party governments. His career advanced with patronage from the former party leader and former prime minister, Jens Stoltenberg. Stoltenberg became NATO’s Secretary-General in October 2014. 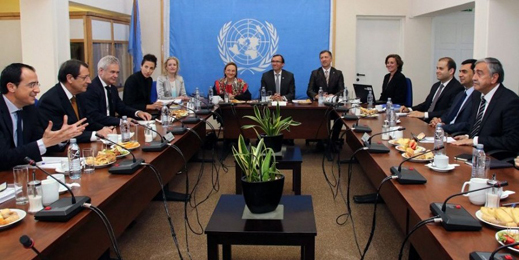 For more details on Eide’s negotiating role in Cyprus, click.